. : The Canada Day Raft - “ a post apocalyptical means of reaching the Heart of Darkness” :: Ski XCOttawa.ca :: Skiing in Ottawa and Gatineau Park :. Last Saturday I had no particular training agenda in mind, and neither did Megan. We rolled out of the driveway on our road bikes intent on enjoying a great summer day in the Gatineau hills. Wakefield is kind of an obvious destination for a day like this, so we pointed the bikes in that direction and enjoyed the relatively recently upgraded (in places) highway 105 and the bumpy, but scenic as usual River Road, along the Gatineau River. We caught glimpses of people floating around on inflatable items of various types, and fishing from their docks and we ambled along, taking things in. When we reached Wakefield, the famous Wakefield steam train was parked for its lunch time turn around, and we took the time to step inside and see what a conductor does. Briefly, it looked to be very hot and fairly technical work involving quite an array of very old looking gadgets and whistles. As we headed back, I noticed that the famous Canada Day Raft was parked on the river, more or less downtown. Not only that, but sitting on the raft’s upper level was teammate Andre Marchand’s younger brother, Curtis. We stepped on the raft and he gave us a tour as well as a thorough explanation of the raft’s history and purpose. He also showed us how to do flips off the raft’s diving board, and coaxed us in to testing it out. Thanks Curtis! We discovered that the Canada Day Raft is really kind of an interesting story and something people around here should know about. 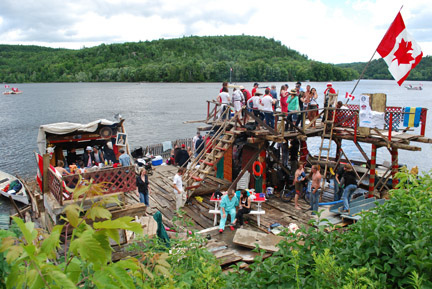 Essentially made out of scrap wood and metal, and described in the local paper “The Low Down” as the “Floating Emblem of Wakefield” and as looking like “a post apocalyptical means of reaching the Heart of Darkness”, the raft is 40 by 50 feet wide, has two stories, and includes the diving board, roap swings, a fireplace, a bar, and of course, coolers full of beer. 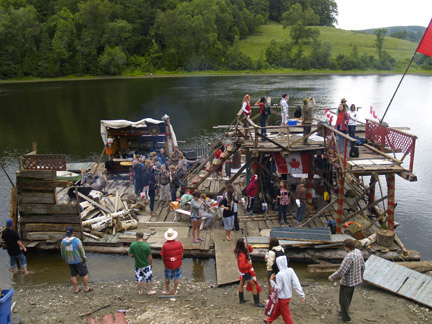 On Canada Day, it also held about 90 partying locals as it drifted down the river from Alcove to Wakefield. The raft (and previous versions of it) has been making this same trip for the last eight years. The raft is built by the Ryan family with help from many friends and about 11 local sponsors. The raft was built over the course of May and June. The party that takes place on it during Canada Day sounds pretty much unbeatable. According to an article in this week's “The Low Down”, some people were playing guitars and singing music, others were cooking bacon and eggs, two dogs were running around and swimming after debris that was falling off the raft, people on jet-skis were helping to keep the raft floating in the right direction, and one kid almost decapitated himself as they were trying to manoeuvre the raft under the Wakefield covered bridge. Some people dove off the diving board, other people waved flags and admired the on-board portrait of the Queen. This year, the raft is also playing a key role in Wakefield's bid to win $25, 000 for upgrades to its community centre as part of a contest put on by Kraft called the Kraft Celebration Tour. 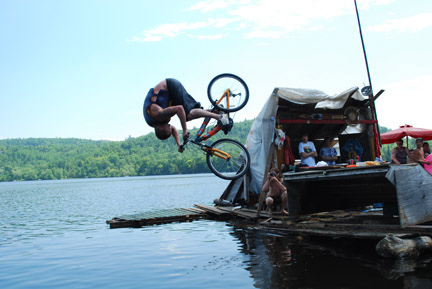 When TSN came to Wakefield, a ramp was installed on the raft and various people on bikes and skateboards hurled themselves off it into the river for the cameras. In addition to the cash, the winner will be the subject of a live TSN SportsCenter broadcast at the end of August. You can vote in support of Wakefield's entry from noon to noon between July 20 to July 21. To find out more, visit Wakefield's page at http://kraftcelebrationtour.tsn.ca/, click on Top 20 Community Finalists and Day 7. You might also want to check out the following article about the contest. Photo Credit: Mark Burgess: The Low Down to Hull and Back News.